The Best Damn Cauliflower Recipe. Ever. There are a few things you can expect to never hear me say in my kitchen, like “No, that’s too much butter” or “Yes, I would like more seitan” or “Make my steak well done.” Another one I never thought would be uttered is “Damn that’s good cauliflower!”, until I made the Roasted Cauliflower recipe I picked up from Michael Ruhlman’s blog. I mean, I like cauliflower, but it’s not something I get really excited about when fall comes (like having an excuse to “warm up” with a hot toti at 10am). But when I saw the picture on his blog, I knew it had to be good. The secret is that you roast it and adds lots of butter (see statement at beginning of post). I am of the mind that if you add butter to something it immediately becomes 47% better, so there was no fail in this one. Accolades were shouted from around the table, and this one get’s instantly added to the fall repertoire. 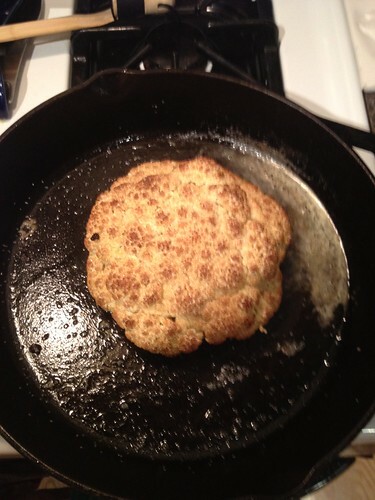 So go check out the recipe and make the best damn cauliflower ever. If not for yourself then to at least to bask in the praise you will receive.